Healing Through History project, an ongoing collection intended to garner 1,000 artworks. Once completed, artworks from the project will be assembled into multiple exhibits referencing the African American experience within the Journey Through Hallowed Ground National Heritage Area. Pieces will remain in the care of the Journey Through Hallowed Ground Partnership, allowing for countless people to have an opportunity to view and enjoy submissions at exhibits and displays in the years to come. Exhibit #1: May 20 – 29, 2017, across the street from Harpers Ferry Historical Association, 723 Shenandoah St, Harpers Ferry, WV 25425. 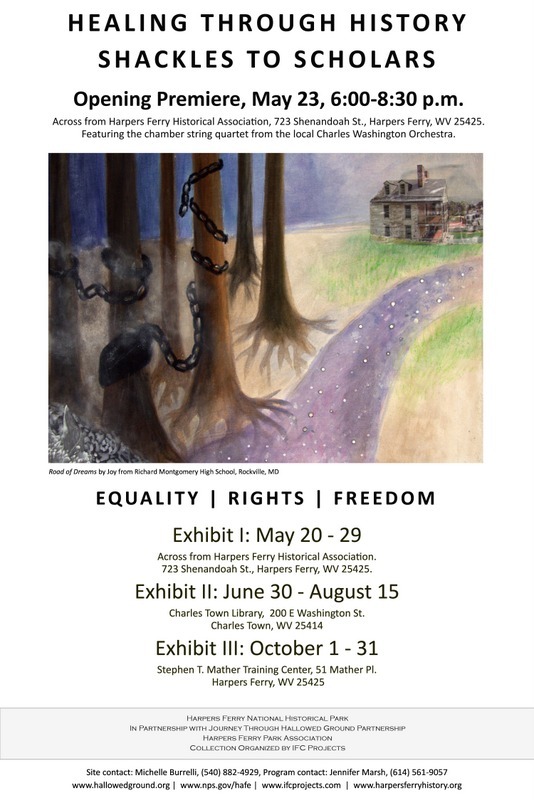 This exhibit will be housed in a fully enclosed and secured tent in the historic Lower Town of Harpers Ferry during the busiest month at the park. The linked map shows the tent location indicated by the red star (the bus in the lower left hand corner is the shuttle bus that takes people from the parking lot to the park, so the exhibit will be one of the first things visitors see once they arrive). Exhibit #3: October 1 – 31, 2017, Mather Training Center, 51 Mather Place, Harpers Ferry, WV 25425. Storer College was a college opened in 1867 as a university for free African Americans. Being the 150th anniversary of its opening, the Park is having a series of events throughout 2017 surrounding the site. The official anniversary is in October (hence the exhibit) and the NAACP is a huge partner on the festivities and commemoration.